The first thing to say about this CD is that it presents truly brilliant and sympathetic performances. The second thing to mention is the excellent programme note written by Alain Cochard. This is very much a model for how these things should be written. There is a full discussion of the composers, their works, the present repertoire and even contemporary critical reviews. All this extends to an essay that is some 2500 words; it is at once interesting, learned and entertaining - a pleasure to read. The only down side of this CD is the very short length of the programme. At forty nine minutes one feels that the record company could have shoe-horned another work in here. Peter Racine Fricker’s sonata perhaps? The repertoire itself is, I suppose, a little unusual for a French duet. I do not know why this should be, but one does not readily associate Gallic musicians with music of the 20th century English Renaissance. So it came as a pleasant surprise to listen to this CD of one old favourite and two relative rarities. 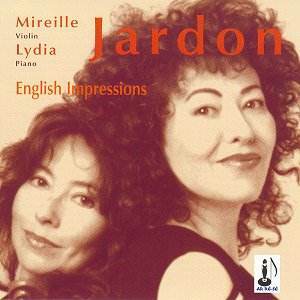 The duet are sisters; Mireille and Lydia Jardon playing violin and piano respectively. Lydia has previously made a recording of Granados's Goyescas. However, Mireille does not appear to have any other recordings to her credit. This is pity. Her technique seems to me to be almost faultless; perhaps a little hard-edged in one or two places. However, on the whole this is truly beautiful and even revelatory playing. Bridge's Violin Sonata H183 is not particularly familiar. It was composed in 1922 and duly dedicated to Mrs Elizabeth Sprague Coolidge, who was a wealthy American arts patron. The Sonata is in one movement - lasting just under 20 minutes. It is composed in four sections or episodes. The first is a complex and involved but never academic Allegro molto moderato. This is followed by troubled Andante that explores the depths of despair. It is almost scary in places. The Vivo e capriccioso is Scherzo-like but with some dark passages. The work ends as it begins, Allegro molto moderato. There is certainly no consummation here. It is still shot through with pain and grief and a sense of futility. Britten's Suite for Violin and Piano is an early work. It was first performed at the ISCM Festival in Barcelona in 1936. This was just before the outbreak of the Spanish Civil War. Britten was the pianist and Antonio Brosa was the soloist. It is an excellent work written in five movements. There is a very short introduction lasting a bare 30 seconds. Soon we are launched into a bouncy Allegro maestoso in the form of a witty march. The Moto Perpetuo is breathtaking. Yet there is nothing predictable here. Lots of wit and humour with an occasional sinister edge. This is fiendish music to play, however Mireille Jardon brings it off with considerable technical skill. The next movement is a lyrical lullaby that is in complete contrast to the excesses of the previous movements. This is tender and beautiful music. The last movement is a Waltz; a parody of palm court music. Yet it is parody and not pastiche. Both composer and soloists pull off this treat with great aplomb. The last work from this exciting concert of English music is from the pen of the Lancashire born Alan Rawsthorne. Rawsthorne wrote for virtually every combination of instrument, including much chamber music and orchestral works with and without soloists. This present work was composed in 1959 and was dedicated to the Hungarian violinist Joseph Szigeti (1892-1973). It is in four movements, beginning with an adagio. This is dramatic and profound music that stirs deep emotions. The following allegretto calls for the soloist to play 'con sordino'. This naturally gives an ethereal effect. It is intimate music that explores a number of tonalities and dynamic effects. The Toccata is a great tour de force combining excitement with moments of release and even lyricism. The last movement is an Epilogue. It is 'signed' as being 'adagio rhapsodic’. This movement seems to be tying up a number of loose ends. In fact it is a summing up. The programme notes state that the Sonata concludes with 'freedom, poetry and a dreamlike quality.' This is correct. This must be one of the most mature and perfect violin sonatas in the English repertoire.